Hard Rock Hotel has released a glimpse of what their first London hotel, located in Marble Arch, will look like when it opens in Spring 2019. The current site is occupied by GLH’s The Cumberland, which announced in June 2016 that it would be rebranded and converted to welcome Hard Rock Hotel. The hotel remains open as it undergoes works to be Hard Rock Hotel London. The Hard Rock Hotel has been designed by the award-winning architectural and interior design practice, Scott Brownrigg, interior designers behind Sky Garden, Google HQ and NBCUniversal HQ all in London. Set to be the ultimate urban hang-out, visitors will experience a true taste of London, boasting a menu filled with new and exciting cocktail creations and fresh, handmade, classic American cooking served with a modern British twist. 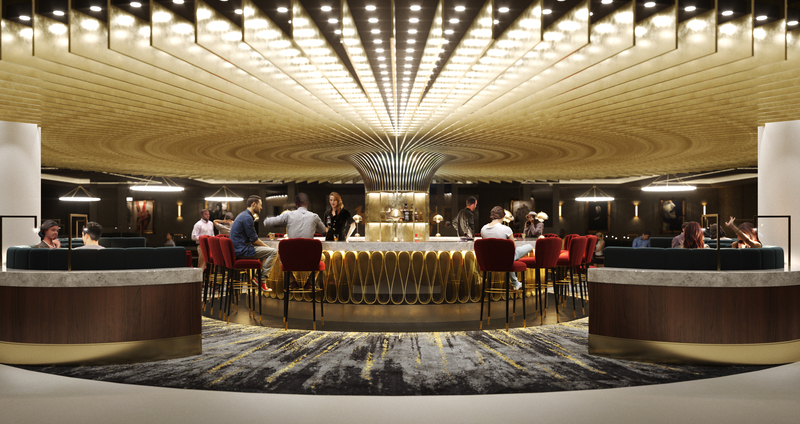 With 370 seats, the hotel’s Hard Rock Cafe will combine an elevated food and drink offering with live events, celebrating both local London and international talent. Th style will attract business and leisure travelers alike boasting around 1,000 stylish rooms and suites, two vibrant bars and a lively Hard Rock Cafe®. The world famous Rock Shop® will be pride of place in the hotel’s lobby offering Hard Rock’s iconic merchandise. Each Hard Rock Hotel has an incredible memorabilia collection – Hard Rock Hotel London will pay tribute to former residents such as Jimi Hendrix, Diana Ross, Bob Dylan, Stevie Wonder and Madonna along with the crème de la crème of contemporary artists. The Hard Rock Hotel London will draw on the legacy of the musical greats who stayed here in decades past, like frequenter Jimi Hendrix, whilst also playing as an inspiration to those who are yet to write their own story. It will be a haven for music lovers and cultural explorers everywhere. Hard Rock Hotel London will also offer Rock Royalty®, the opportunity to elevate one’s London experience with luxurious Rock Royalty rooms and suites offering extra perks like a personal concierge and access to a lavish Lounge.